Powerade Towns’ Cup holders, Ballynahinch II will begin the defence of the trophy with a home tie against Carrickfergus. 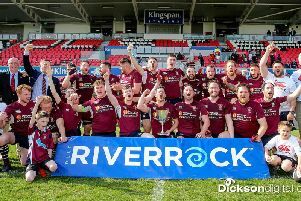 The first round draw has paired the current Kukri Section Two leaders, Carrick away to the Ulster 2nd XV League side ‘Hinch on Saturday, January 2. Tie of the round sees Ballymena II take on Ballyclare while Kukri Section Three highfliers, Limavady - unbeaten to date - have a home draw against Kukri One side, Portadown. BYES: Larne, Ballymoney, Lurgan, Donaghadee, Coleraine, Banbridge II, Dromore, Omagh Accies, Ards.